Ely is an important crossroads town, centered on the intersection of US 6, US 93 and US 50, towards the east edge of Nevada. 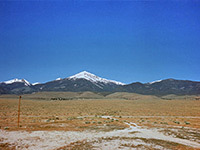 Like many Nevada settlements the town is built on a valley floor, enclosed by long, barren mountain ranges, aligned north-south; those to the east (Schell Creek Range) and south (Egan Range) are part of the Humboldt-Toiyabe National Forest, and the former contain several campgrounds & trailheads just a few miles away. Ely is the closest major city to the least visited national park in the West, Great Basin, though the entrance is still quite a long drive (66 miles). Ely has a compact, mostly residential center; shops and hotels are concentrated along the western and southern approaches. Newly built late 2019, the pet friendly Holiday Inn Express has a west-central location in Ely along the main road, US 50, backing on to a low ridge, within walking distance of shopping and dining, and also of the White Pine Public Museum, which has many exhibits about the history and settlement of this part of the state. The hotel offers 100 guest rooms & suites, business & fitness centers, meeting space, a steam room and an indoor pool. Complimentary buffet breakfast is prepared each morning. The full service Ramada Copper Queen hotel has a central location in Ely along the Great Basin Boulevard, one block from the US 50 - US 93 junction, near to a selection of restaurants, bars and small shops. There is also a restaurant on site (Italian style), and a 24 hour casino (with 80 slot machines), plus meeting facilities, a business center, a fitness center and hot tub. Fre enhanced continental breakfast is served each morning. Accommodation includes a selection of kitchenette suites. On the southern approach to Ely (US 50/93), the Motel 6 is a small, cheap, clean and well regarded establishment, set back a little from the main road and so providing a quiet night's sleep. There are various restaurants and stores close by, part of a recently extended shopping center. Facilities at the pet friendly motel comprise internet access and a refrigerator in some rooms (both subject to a small fee), an outdoor pool, cable TV, free coffee and guest laundry. Most of the casinos in Ely are about 1 mile away to the west, along US 50.